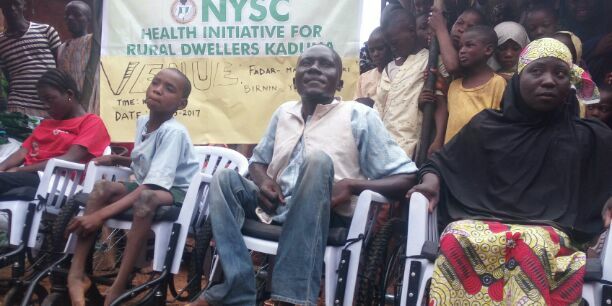 As National Youth Service Corps flag off this year’s Health Initiative for Rural Dwellers (NYSC-HIRD) programme on Wednesday, four beneficiaries, Abubakar Isiaka, Nasiru Aliyu, Sha’wa and Maryam Aliyu, who were drawn from Soba, Lere, Igabi and Kaduna South local government Kaduna state have gotten a wheelchair each to ease their mobility. Director General of NYSC, Brigadier General Suleiman Zakari Kazaure who spoke through the scheme’s Coordinator in the State, Mallam Bello Balama while distributing the wheelchairs and insecticide treated mosquito nets to the beneficiaries at the palace of Sarkin Birni Yero said, the HIRD out-reach programme was designed to address the problem of poor health services associated with rural areas. According to him, the medical team of corps members have painstakingly located the community where they discovered is far from the reach of government hence the intervention for the four days programme. He said, “HIRD is an initiative of NYSC DG which started two years ago to take care of the medical needs of rural dwellers most of whom don’t have access to health services. Our corps doctors have took their time to licate this community and will be here providing one form of medical service or the other to these people within four days. “This year’s out-reach is like two-in-one event because we have a partner called Grace Project International that is given us the wheelchairs to distribute to the beneficiaries across the country. It is a nationwide thing and each state get between 4-7 units depending on the prevalence. District Head, Birni Yero, Alhaji Mansur Ismail Bamago, who expressed appreciation for the gesture by the NYSC, used the opportunity to call on government at all levels to make medical services available to rural dwellers saying such is far from them despite the location of the community. “We are very happy for this development. We thank the NYSC for deeming it fit to identify our community as second beneficiary of the health initiative which I’m aware started two years ago. “I will also like to use this opportunity to call on government and corporate organizations at all levels to take health service delivery to rural dwellers. We should feel them not only during election. People need some of the services to improve their health standard and economy because health is wealth”, urged the traditional leader. Speaking on behalf of the beneficiaries, Sha’wa thanked the NYSC and Grace Project International for coming to their aid adding that, the wheelchair will improe their mobility as against the usual backing support some of them get from their family members and relatives around.